admit cards are released on the website of DTE Maharashtra. Students appearing for CET 2017 in Maharashtra can download the admit cards from the website dtemaharashtra.gov.in from 25th April 2017. Maharashtra CET 2017 Exams are dated on 11th May 2017. 3.8 lakh students from Maharashtra registered for CET 2017. All these students needs admit cards to attend CET 2017. Students can download their CET 2017 Admit Cards from the website dtemaharashtra.gov.in. Take a print out of the Admit card to get the admission to the Examination. The Common Entrance Test is held to test conducted for admission to First Year of Full-Time Degree Courses of Technical Education (Engineering and Technology, Pharmacy and Pharm. D) in various institutions in Maharashtra. In 2016 53 students got marks from 191 to 200 which was the highest score in CET 2016. Download the admit card and take a print. The complete links to all the admit cards and brochure are given below. 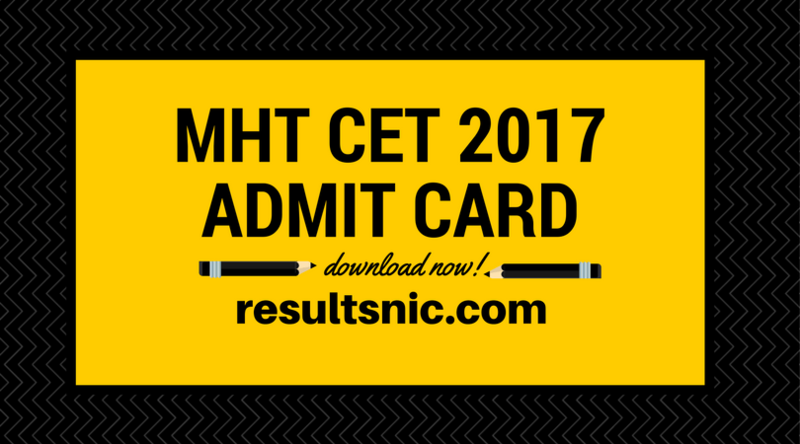 CET 2017 Admit Cards, MHT CET Exam 2017.